Following the Paris premiere & photocall, Emma Watson jetted off to London to do more promotions for the 'Beauty and the Beast' yesterday(February 22nd). The actress took to her The Press Tour instagram page to show off her promo look. 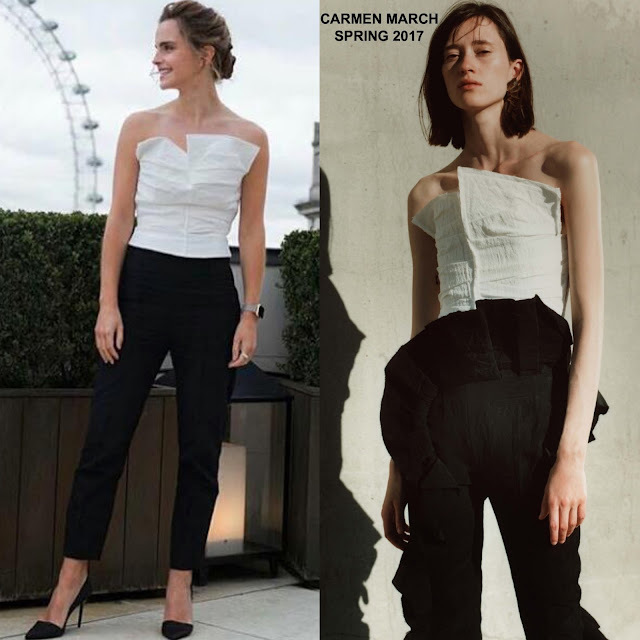 Emma posed for the gram wearing a CARMEN MARCH SPRING 2017 ensemble which featured a white strapless bustier top and black ankle length trousers. Emma stated on her insta page that for this promo tour, she will be wearing smaller, independent brands that she finds along the way. I never heard of the Madrid designer until now so I am glad that she will be ditching bigger name brands and shining light on the lesser known. On the beauty end, she went with a complimentary up-do and a pink lip. CATBIRD earrings, ALL BLUES rings and her custom BURBERRY black organic silk pumps finished up her look.